A friend comes in nick of time that they are needed most – that one person that speaks out when others think they are not close enough to intervene. Sometimes we found that friend/s within the family, other times it is an outsider who recognises humanity we all share that tells us what others would rather be quiet about. Accusing fellow Nigerian of being a witch is still very common both in our cities and small towns. It only takes one person to voice out their narrow bigoted views, then it goes on from there. The most irritating one was of young children, they are the most vulnerable and yet those who are ‘unlucky’ to be disabled are outright labelled as witch that deserved to be tortured to death by own family, orchestrated by bible carrying prophets. 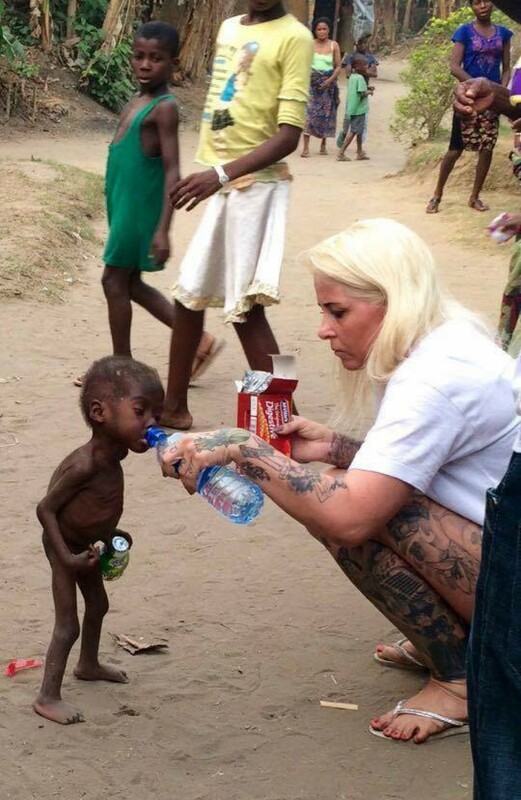 That friend, for the 3 year old ‘Hope’ from Akwa Ibom wasn’t any of the neighbours or Nigerians for that matter, it was a Danish aid worker Anja Ringgren Lovén who refused to look the other way, she helped safe the little boy’s life. Nigeria, when it comes to beliefs in witchcraft, is a pretty messed up place, in all of our regions we have our poisons that is eating us alive. In Yorubaland, it is girls and women that usually get accused of witchcraft, in the East it is their boys that’s their enemies – what a world. Often this accusations is backed up by bible quotes and often the accused are disabled or that something happened in the family and because we just have to blame someone, then we picked on the most vulnerable people around – young child or elderly. Southern Nigeria is home to most of the country’s christians – they are going to drive us all to heaven and yet the most vulnerable ones amongst us are being tortured by own kind – God is in heaven shaking his head. Centuries after the Europeans have moved on from witch hunting their own kind, Nigerians are knee-deep into it. Centuries after the Europeans have managed to separate state from church – my people are still knee-deep, wasting millions of $s on religion instead of developing ourselves. I suppose my people are super loyal to those that introduced the religion to the country – when will our own enlightenment arrive? A fellow Nigerian who was saddened by this event sent the link a couple of weeks ago, he thought Nigerians need to talk amongst ourselves to move away from this primitive attitude. I told him he was mistaken if he thought the enlightened ones are not aware of this, of course they were but why should they care when their families are not directly affected? I am thankful to the Danish lady, Anja Ringgren Lovén who took on Hope’s case, glad that the poor boy is responding well to treatment. Happy that good people of the world donated to help Hope, I am sure there are local people involved in this process too so thanks to them. tend to feel offended by ‘grim’ photos, oh well, this one is worth copying, I think. Thankfully, the world is growing smaller by the day, many more people in Hope’s shoes will be saved. Most upsetting bit here is the deafening silence of our our people. I think in Europe, the period where religion started to take a back seat began with the ‘reformation’. I’m not sure why Nigerians persist in holding onto many anti-social beliefs, when it clearly isn’t serving them or it’s victims well. Saying nothing and turning our heads the other way, is not a solution. At least talking about it, is better than using the ridiculous ‘it’s a taboo’ excuse. You had the decency to highlight this, so that is a positive – problem is that may take forever to have an effect, but it is a step in the right direction, for that I’m grateful – thank you. Ha, thank you. Your interest is impressive too given you’ve never lived in Nigeria. Many people in your shoes just do ‘no be my wahala shrug’ so thank you for reading. I can’t say I understand fully the reasoning behind holding on to anti-social beliefs but I sense that people are tired of it but are too terrified to face it squarely. Remember the case of Prophet Helen – the Pioneer for child witch hunt crusade during her visit to the UK a few years ago? It was people who knew her work that lobbied that she be sent back to Nigeria, what l would love to see is her getting same treatment back home with government support. The case of Helen Ukpabio (of Akwa Ibom state), what you said makes perfect sense and touched on the fact that institutions be it state or private are a mirage. They are ineffective and are mainly staffed by people who do not care for their organisations, not to mention society as a whole. Hence the total inability by them to do anything meaningful consistently. The fact that so many people are abandoned by their families and are left to fend for themselves, would indicate that Nigeria’s embrace of religion is superficial, otherwise we should not see homeless abandoned children, and other sections of society. Initially, when I saw that picture – I thought it must be some other ‘African’ country, but I realise that was the propaganda I was fed as child to think that Nigeria is above that. I now know that Nigeria is no better than the ‘worst’ African country, whichever one that may be now. Oh well jco. If it makes you feel any better, many of us that grew up at home were fed with bigger propaganda, a little bit more painful as we can see reality on the road to be different. I must say though, even I was shocked with this photo. We have pretty much the same beliefs of witchcraft in the SW but I have never seen a child being left to die slowly such as this. To see similar situation one needs to visit our prayer mountains, even there it was mainly our disabled, mental health patients and the elderly and not young children such as Hope – well same difference. Talking about superficial religion, where do we begin? And they milk it to the fullest during the last regime – smart Israelis and Saudi Arabi tourism industries. I think your move about highlighting these injustices is good, now we are all aware we are as guilty as each other about abandoning the vulnerable. The next step would be to see what others (if not ourselves) in a similar situation have done and made progress. All reps from organisations (that deal with the needy) in all 6 geopolitical zones could work something about amongst themselves and start taking action. Nevertheless, it all begins with awareness – which you have drawn our attention to. As for the Israelis and Saudis – I can’t say I blame them, this is a world where people are not shy about exploiting you. So if people willingly throw themselves in the name of ‘religion’ at the feet of Israel and Saudi Arabia, they only have themselves to blame for any mistreatment or exploitation. People have to stand back, and think for themselves, rather than follow the dictats of their religious leaders. Who are milking them to ‘max’. Only that I am not entirely sure people around the area where this practice is rife believed these ‘witch-kids’ don’t deserve to starve to death in the first place as this sort of thing has been going on for some time. On agencies – case with reference to witch, mental health or disability is often seen as the job for self-ordained spiritual leaders as the ‘attack’ is beyond ‘naked’ eye. I know of one organisation based in Ibadan that takes it upon itself to accommodate abandoned children such as this – not too surprising that it was started by an Oyinbo, can’t seem to find them now but I am sure thy have information online somewhere. Personally, I have a family member whose’s son has hydrocephalus that results in his head growing larger than normal therefore put huge weight on his brain. I was gobsmacked to hear years ago that the mother was lied to that the poor boy was a witch. I believe if everyone of us who knew better do not compromise on the truth when facing situation like this with friends and family, we are one step further, abi? Thank you FK, I will have to take time out to read this info properly and think, please excuse a delayed reply. I read the reference and the other reference it pointed too. You are overflowing with insights and wisdom. Kudos for not seeing beyond Alhaja’s insensitivity – and granting her the job. I do understand that, and completely agree with you. Thank you for sharing such gems. I know, can you believe anyone can be so cruel in Nigeria? Slow death. More upsetting is that other children are seeing this, I wondered what they were thinking? I think you do a lot of good with your writing, Fola. Thank you Leslie. Hopefully it will help at least one person to re assess their beliefs. Never under estimate the power of good. A heart-breaking story, boldly told, Folakemi. It takes up so much energy to hate and abuse, yet so many humans everywhere go in for this behaviour, and almost always on the basis of myths perpetuated by themselves, or the dogma of groups they identify with. A friend requested I blog about this two weeks ago while I was on holiday, I just have to put is aside as it was just sad this continues to happen everyday, and yes it is all based on myths.